If your nonprofit is already using Salesforce as your CRM, you’ll want to make the most out of the features offered by this popular platform. Your organization will also want to make sure that all of your software systems work together seamlessly to keep donor data accessible to reach out to supporters more effectively. Some of the most valuable donor data your organization can gather comes from your supporters’ giving activities. Whenever your supporters make gifts to your organization, your software systems should streamline this information to automatically update their profiles in your CRM so that you can learn more about their giving preferences. To gather, store, and organize giving information most effectively within Salesforce, your organization will want to select Salesforce donation processing software to collect and make good use of this essential information. Today, we’ll take a look at how Salesforce donation processing software works and how a fully integrated solution will benefit your organization’s fundraising efforts. What kinds of information can you gather using Salesforce donation processing software? How does information from processed donations flow into Salesforce? What can your nonprofit learn from the data your Salesforce donation processing software collects and stores? How do integrated Salesforce donation processing tools benefit your nonprofit? Each time your donors give, they provide your organization with more of the information you need to structure your approach to help ensure their lasting relationships with your organization. Let’s begin by looking at the types of valuable data you can gather in your CRM when you use Salesforce donation processing software. 1. What kinds of information can you gather using Salesforce donation processing software? Each donation your supporters make provides your organization with a wealth of information on their interests, preferences, and relationship to your nonprofit. You’ll be able to supplement the existing data in your Salesforce CRM with useful demographic and giving history data and use information from new supporters’ gifts to begin building their profiles in your CRM automatically. This information makes it easier for your organization to segment your donors and communicate with each group more effectively. How your supporters prefer to give. Are your donors using your website’s donation page, giving via their smartphones, or do they prefer other methods? This information can help you determine not only how your supporters choose to make their gifts, but also the platforms on which you’re most likely to reach them. How often your supporters give. Recurring giving provides a foundation of support for your organization’s good work and creates and strengthens lasting relationships between you and your donors. Your organization will benefit from knowing how often your supporters give as well as their favorite times during the year to do so. Which projects your supporters contribute to. Knowing which aspects of your organization’s work different groups of donors support is essential so that you can address their specific interests in your communications with them. Your organization could gather similar information using individual Salesforce apps and may be doing so already. However, the price of these one-off apps can add up quickly! A fully integrated Salesforce donation processing solution also allows all of your fundraising tools and other features to communicate with each other and with your Salesforce CRM. This saves your organization time and money when compared with one-off apps. The central benefit of a fully integrated system is that your fundraising tools augment the donor data in your CRM with gift information, while the updated records in your CRM inform your fundraising strategy. The automatic and continuous bidirectional flow of data makes this process possible. 2. How does information from processed donations flow into Salesforce? To make the most of your fundraising efforts, you’ll want to save your organization’s team time and ensure that you always have access to the donor information you need, including data from donation processing. You’re more likely to achieve these goals using a system that integrates with Salesforce and offers features that help your nonprofit stay efficient and organized. Bidirectional data syncing. With a two-way transfer of information between your Salesforce donation processing software system and your Salesforce CRM, your organization will have complete records of your members and their giving histories in both systems. This makes it easy for members of your team to access all of the most relevant data from either location. Frequent data syncing. Regular updates are essential so that your organization has the most current information available on each of your supporters and their gifts. When your Salesforce donation processing tool can sync with your CRM as frequently as every five minutes, you won’t risk losing any valuable data. Syncing with Salesforce’s native records. It’s likely that you’re already using native Salesforce records such as Contacts and Campaigns to manage your supporters, their gifts, and your fundraising efforts. Choose a Salesforce donation processing software solution that’s able to sync with these records. Match and merge features preventing duplication. Duplicate records in your CRM are confusing and unnecessary. Look for a Salesforce donation processing tool that automatically identifies and merges duplicate giving records or merges these records according to preferences that you set manually. When information flows automatically between your Salesforce donation processing system, your online fundraising software, and your CRM, your organization has access to the information you need to thank your supporters, learn more about them, and reach out to them in the future. You can use this valuable information to help your organization build lasting relationships with your donors. 3. What can your nonprofit learn from the data your Salesforce donation processing software collects and stores? Your supporters value your organization’s efforts to personalize your communications as much as possible. When you’re able to address your donors’ individual concerns, interests, and preferences, they’ll understand that your organization values them and will be motivated to continue their contributions as a result. Your nonprofit can use the data that your Salesforce donation processing software collects to learn how you can communicate more effectively with different groups of donors. When your Salesforce donation processing software, other fundraising tools, and CRM system are integrated, your organization gathers all of this information automatically. All your team has to do is decide which attributes you’ll use to segment your donors ahead of the next round of communications you send to them. 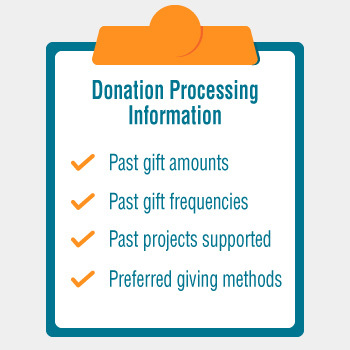 Using gift processing data and other information indicating the nature of your donors’ past involvement with your organization allows your organization to reach out to different groups more effectively. While segmenting your donors is an essential step in the process of creating and sending online communications, it’s just as important before you engage different groups of donors in person. Understanding your donors’ giving histories is particularly important when your organization determines who you should approach about potentially making major gifts in the future. You’ll gather important donor and gift information and incorporate this information into your communications most effectively when all of your systems—your Salesforce CRM, your Salesforce donation processing software, and your complete suite of online fundraising tools—integrate with one another. 4. How do integrated Salesforce donation processing tools benefit your nonprofit? When it comes to your nonprofit’s fundraising efforts, every piece of information you can gather on your donors and their giving histories is valuable for building stronger connections between them and your organization. Of course, not all of this information originates in the same place: as supporters give to and interact with your organization more regularly, your understanding of each supporter becomes more comprehensive. This is why your organization benefits from a Salesforce donation processing software solution that’s also a complete set of fundraising tools: you’ll be able to gather incoming information from all sources and store it all in your CRM! Marketing automation. Once you’ve segmented your donors, you can communicate with each group of your supporters efficiently by sending out automated emails. To keep your supporters involved, you can set up automated email series that prolong their engagement with this channel until they complete a goal such as making a donation. Customizable online donation form creation. For many of your donors, your website is the first place they go when they want to learn more about your organization or make their gifts. Salsa Engage for Salesforce facilitates the creation of online donation forms that you can customize to match the rest of your organization’s branding. Peer-to-peer fundraising campaign page creation. Perfect for leading up to an event, peer-to-peer fundraising campaigns transform supporters into volunteer fundraisers for your organization. Salsa Engage for Salesforce creates the shareable donation pages that your volunteer fundraisers will customize and spread over email and social media. A fully integrated solution such as Salsa Engage for Salesforce helps your nonprofit gather and organize all incoming data in Salesforce as well as use it to create more effective outreach materials that better address your supporters’ unique interests and needs. With a Salesforce donation processing solution that uses integrations to do it all, you’ll save your organization’s team time and you won’t miss out on the information that will help you stay connected to your donors. With the right software solutions and an effective plan for incorporating donation data and other supporter information into your outreach strategy, you're sure to strengthen your relationships with all of your donors.